I have had tendinitis in my left knee for the last two months. I believe I sustained the injury from the North Coast Trail, and it hasn't gone away. The hope is always that these things just disappear, but alas, this injury has needed serious attention. Nevertheless, I have continued my training while doing some knee rehab at the same time. In all likelihood, I will need to take some time off from running in the fall to recondition myself. 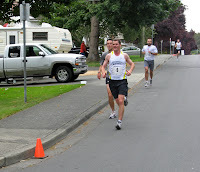 Because my sponsorship allows me free entry into the Esquimalt 8k run, there was no way I was going to pass up taking on this race. The course is a hilly 8k race, that doesn't feature a tremendously deep field, but does have some star runners in it. 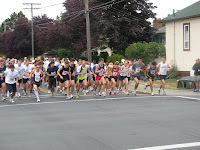 Because the race also falls in the middle of the summer, some key runners do not take part, as they have summer plans. My family came down with me, and I arrived in time to have a suitable warmup. Chris Callendar was there, and I warmed up with him. All my focus and attention was on my knee, but it seemed to be fine for the moment. As the race began, I felt good, and felt loose. The knee, would give me no pain whatsoever during the race, just showing what adrenaline can really do. The course winded down a large hill, and I knew that for every hill that we went down, we had to come back up. I also had no idea what pace I was going, or what my splits were, as I had no watch on me. My plan was simply to follow Chris Callendar as best as I could. And, that I did very well for the first 3k. At about the 3k mark, Chris and a few others sped ahead as we entered into the DFO area. At 4k, Ming would pass me in an expected move. My pace was still good, and there were not too many people ahead of me in the race. I figured I was in about 20th place. The course did not get any flatter. It basically went up, down, flat...then up, down, flat...etc. As I made my way towards the 7k mark, Ming was now way ahead, but I was gaining on Chris and another runner close to him. I could hear my family cheering for me at this point, and at the same time, I caught Chris. I knew he was struggling, and I was prepared to take full advantage, having never beaten him before. However, he would stick to me for the rest of the race, and in the end, he and I would finish strong and finish together with a time of 31:23. The result was 15th overall, and 4th in my age group.